Oh, Carol. We love you so much, and we are definitely worried about what happened to you, since kind fates don’t often befall those who get kidnapped on The Walking Dead. But far less kind fates happen to people that Carol gets close to, as the last six years have shown us, and tonight’s episode pretty much sealed the deal on the fate of one particular character: Tobin. To the casual viewer, that name might not even ring any specific bells, as Tobin is the “oh, that guy” of the Alexandria community. The hard-working nice guy who almost got that one character killed that one time before Abraham got all buck. He’s the kind of character whose ability to avoid death is surprising, though not necessarily undesirable. But now that Carol has taken a liking to the man, as evidenced by her cookie conversation and that smooch, all of Tobin’s abilities are going to come to a halt soon. After all, Carol’s baked goods in the opening didn’t just tease the front-step kiss coming later in the episode, but it also reminded viewers of the latest casualty in her life, Sam Anderson. Carol tried to be a complete douchebag to Sam in order to not form a bond, but the young and abused (and absolutely insufferable) boy just kept looking to her as a beacon of something that didn’t relate to his family life. And in the end, it was her threats that kind of caused him to act out during the attempted escape, where he got all ate up. Again, Sam was just the latest. Carol’s earliest days were with her husband Ed and her daughter Sophia. Ed was a misogynist waste of oxygen and his death was very welcome, but he was still her husband. And we all remember what happened to Sophia, since her Season 2 disappearance remains a blight on the show’s past, no matter how satisfying the reveal. Carol’s survival basically caused T-Dog’s death, and they were good friends, so it counts. 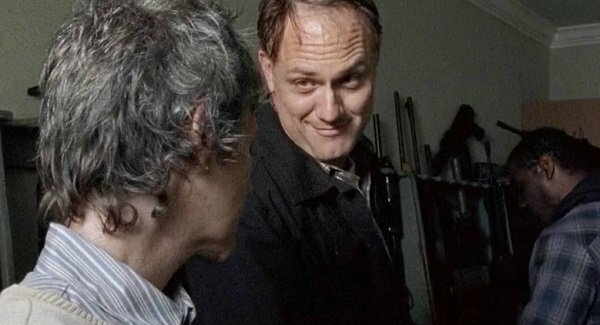 Just when Prison Axel was getting his moment to shine during a conversation with Carol, he got shot in the head. No one expected anything good to come of Lizzie and Mika, and their deaths were two of the most fucked up exits on the show. So no, Carol showing someone any kind of affection is not good for their well being. Now, maybe nothing bad will happen to Tobin, and he’ll live a long and happy life with Carol by his side. But just look at this exchange between the two when she brought him the cookies. Carol: Just put it in your mouth, jerk. Tobin: These are the best beet and acorn cookies I have ever eaten. Carol: You screwin’ with me? Tobin: No, seriously. They’re amazing. In that moment, the sexual tension (or at least the lip-locking tension) is so thick and palpable that it’s almost surprising Tobin didn’t just choke to death on cookie crumbs right there in front of his house. The Walking Dead airs Sunday nights on AMC. Do You Think That Kiss Sealed Tobin's Fate?